I call the “Comments” section the Black Hole of Facebook. Not that I think comments are bad. Or that only “good” comments should be allowed. Which is why my Facebook posts are non-political, mostly non-controversial … and generally overlooked. I mean the black hole in the sense of a car wreck – you know, you don’t want to look but you can’t help yourself. And then, you’re in – forever! Occasionally – and usually ill-advisedly – I fall into the hole and read what friends have commented – and to what they have responded. This one caught my eye. Commenter Z: It’s the lack of what your God stood for that has gotten to where we are: Love thy neighbor. The lack of God has gotten us to where we are. Right. 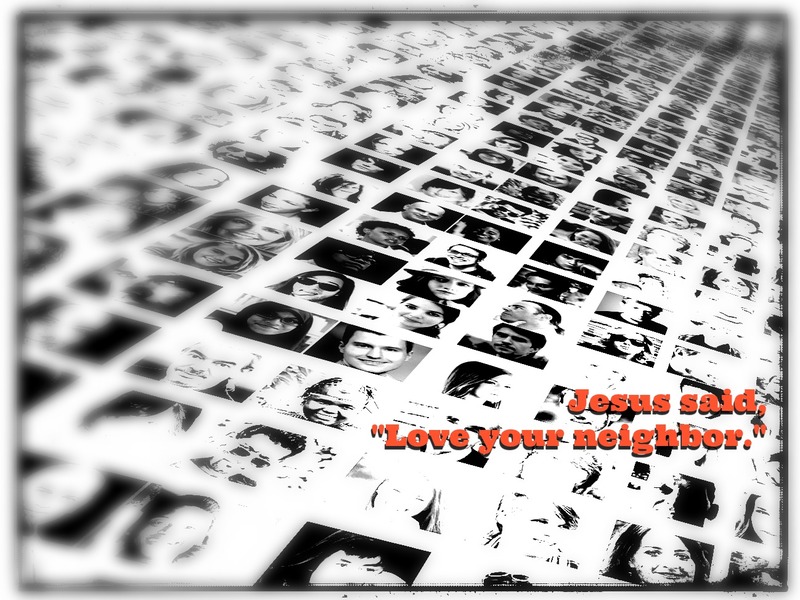 The lack of what God stands for has gotten us where we are – Love thy neighbor: Um. Right. You know, like when we take a class in college for no credit, take no tests, do no work… and accept no measure of accountability. For some reason, we want something out of the class. Maybe we are interested in just one aspect of it? or a need to claim we know what we are talking about when the class subject comes up? Or maybe we want to say we “learned” under the best teacher? Yeah, no. There is no way that we can claim any kind of authority or bragging rights when we audit a class. When we attend every single class, do all of the homework, raise our hand and ask the questions, and take (and pass) every test, and only then can we say we actually “took” the class. Just like James tells us: Don’t merely listen to the Word… Do what it says. So, I’m a bit convicted right now about Z’s comment. The “what God stands for” part. It’s one thing to promote what God promotes, the sanctity of life, and declare “…children are a heritage from the Lord, the fruit of the womb a reward,” and another to willingly sacrifice for the lives of the poor, the orphaned, the homeless and forgotten. It’s one thing to carry the banner of Christ, speaking the truth, introducing others to Jesus, refusing to back down when challenged and called names. It’s another to create relationships built on love and respect. It’s hard to turn the other cheek. It’s hard to be a peacemaker. He couldn’t have made it much more clear or straightforward. So here it is. A quick three-question check-up for the condition of my heart. I guess it really is just one question: Do I love everyone? A 3-part check-up plan: Do I love everyone? Click to tweet. Here’s my problem: A new resident in the retirement home in which I live is very hard to “like.” I remind myself daily that I need to continue to pray for her. I do love her in the best sense of the word. She is a Sister in Christ. Because she is not “likable” doesn’t mean I should “hate” her. Actually, I feel sorry for her.